Short Throw Projection | Small Spaces. Giant Images. Can I use a projector to create a giant image in a tiny space? Yes, you can! One of the perceived limitations of projection displays is that you have to have a lot of room to make a big image. But while “throw distance” is a factor, the reality is there really are very few screen size limitations to speak of with today’s projection technology. Important Note: We strongly suggest that only fixed frame screens or tensioned manual or electric screens are used with short throw projectors, as projection on a non-tensioned screen may present a jarring 'ladder' effect from the slight waves in the screen material. Tab tensioned and fixed frame screens do not suffer from this same effect. All you have to do is choose the right projector. Here’s a quick guide to doing just that. Technically speaking, “Throw ratio” is an equation that explains the distance from projector to screen compared to the screen size. For example, a standard projector might have a 1.5:1 throw ratio. So, to get a 60-inch image; the projector would have to be 7.5 feet back from the screen. Or, approximately 1.5” back for every 1” of screen. Any projector will have this ratio listed in the general specifications. Currently there are four categories of throw ratio; standard, long, short, and ultra short throw. We will have to rule out standard and long throw projectors and focus on either short or ultra short throw to get our big image in a small space. Here’s a chart to make this a little clearer. So, with an ultra short throw projector, you can get a 5 foot (60”) image with your projector placed just 1.4 feet (18”ish) from your screen. That’s a very big image in a very tight space! 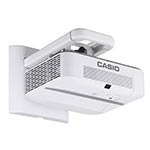 Every projecting situation does not require a short throw projector. 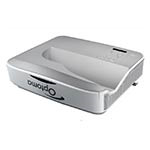 But there are some situations in which a short throw or ultra short projector is the perfect solution. Small learning spaces, conference rooms where detailed documents are shared, trade shows where a big image gets big attention, and in home theaters with projector placement limitations. Can Short Throw Projection Offer Lower Cost Digital Signage? Short throw projection is a growing segment of the projection market. New applications in digital signage have grown out of recent advances in short throw projection. 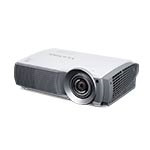 Over 90” it is likely to be more cost effective to use a projector vs a large screen LED display because of the weight of the display, installation requirements and overall cost of the unit. If you’d like to know more about short throw as an alternative to LED displays, contact a Projector Expert to get more information.